Today's nursery was designed by event and wedding planner Kristin of Fabulous Fete for her son. This rooms has a classic traditional East Coast vibe with a punch of drama from the fabulous rug - a la Mary McDonald. Don't you love the added monogram on the roman shade too? There is so much attention to detail in this room you can tell she has a designer's eye when planning weddings. 1- What was the inspiration for your room? I love monograms and wanted a baby nursery with a monogram but one that doesn't look to childish or children's themed. 2 - What was the first piece that your purchased for the room? The antique colored engraving of children playing. I found it on eBay and knew that it would go in a child's nursery, it didn't matter if it was a boy or girls room. 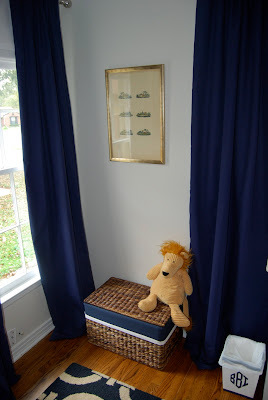 4 - Now that your room is complete, what would your change or do differently if you could? I'd get a different chest, now we have a dark coffee colored chest instead of the white chest. The white chest was so old that it was hard to open the drawers with one hand! I also might get a rug made from different materials or weave. The rug has a lot of link that comes off when the baby plays and the lint gets on his toys and on us when we sit on the floor. Thank you Kristin for sharing this room with our readers! 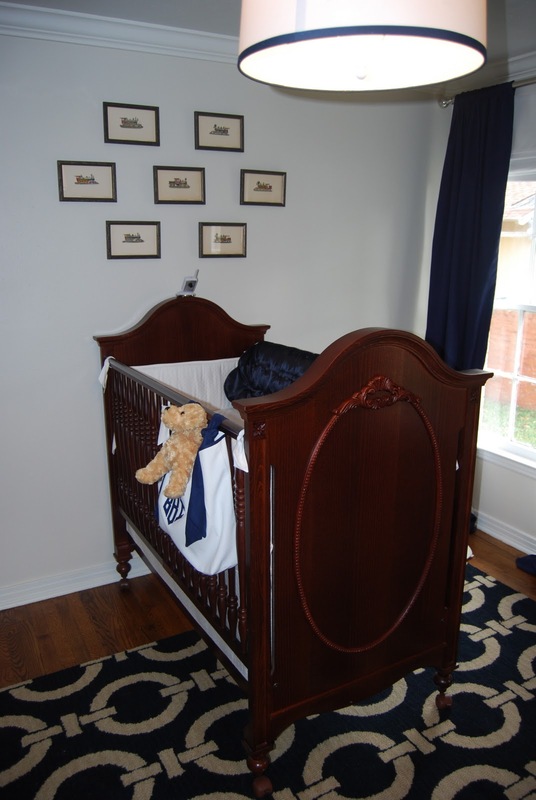 I have that rug in my family room, and love it in this classic nursery.